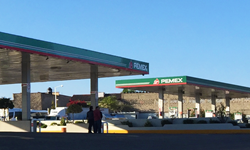 Karim Bousfiha, Vice President of Marketing and Business Development for CNG Source, announced that the company was formalizing a deal with V-Energia for a large public CNG station to be built in Mexico. Bousfiha provided some insights about the project mentioning: “This will be a high performance station, with capability for both the vehicular as well as the virtual pipeline industry, serving businesses located off the natural gas pipeline network through tube trucks and GTMs. The station will be geared by four compressors driven by natural gas engines providing maximum performance at an exceptionally low cost of operation which will enable flexibility, profitability and high margins, these key advantages will position our client in a strong competitive spot, ahead of the pack. Among many others, one of the highlights is the equipment’s long uptime intervals, reaching up to 16,000 hours of operation between major services doubling those of the most advanced competitors"
Bousfiha added "The NGV or vehicular side of the station will boast cutting edge dispensers based on a custom version of CNG Source's Triumph model including our proprietary technology Tank-Sense allowing for an accurate temperature compensated fill, providing a superior customer experience with every fill, every vehicle, every time. The fueling hoses will feature both NGV1 and NGV2 options for each position. The components will be integrated within the canopy's structure, allowing for an overall uncluttered look and feel. A complete remote monitoring and control system will allow operators and managers to control and supervise the station virtually from anywhere in the world at any time"
A veteran company based in Indianapolis, with offices in Houston, TX and Monterrey (Mexico), CNG Source develops and manufactures game-changing equipment, and also provides custom engineered solutions for CNG station builders and fleets. Offerings range from time-fill posts and CNG dispensers to complete fueling solutions. CNG Source also leads the industry in specialized CNG engineering and R&D services. Turnkey solutions for fleets are purposely designed to evolve and grow along with expanding businesses. CNG Source, led by Purdue University mechanical engineer Doug Lubs, harnesses decades of experience to ensure future success.